Events- It seems that you have made remarkable progress in the last few years, even compared to a year and a half ago when we had our first interview with you. Ali Ashraf Afkhami- We have indeed: we made remarkable achievements in 2004 and so far into 2005. We had a very high level of profits. 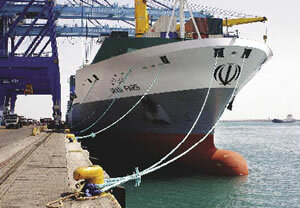 For the first time in the history of the shipping industry in Iran, our revenues exceeded one billion dollars, with excellent profits. So was our productivity which rose from 65% to 90% during the same period. So, today we make use of 90% of our assets. These are excellent news for our team - from sailors to captains, from captains to managers - everyone is very pleased indeed. 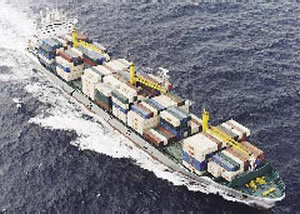 At present we are a large shipping company by world standards, one of the largest international shipping companies. We have already implemented a large part of the international networks we had designed and set as one of our goals, with our strategic vision of "Your Global Partner". Among our achievements is the full computerization of our activities, which has been implemented "in house", and entirely by our own people. Today our clients can trace and locate each and every one of the containers we carry for them from their offices and/or homes. They can also book and make/receive payments electronically in most parts of the world and we hope to offer the same services in Iran as soon as the infrastructure is in place. Last year our container throughput was one million TEU (each TEU, or twenty equivalent unit, being equal to one 20 ft container), and this figure is over 10 times what we handled five years ago, when we began our container shipping activities. We now rank the 25th in the container shipping business worldwide. As far as market share is concerned we are the number one in the Far East Westbound shipping route for the second consecutive year with 14.5% in 2004 despite the enormous competition that we face there. In addition to our regular weekly service we also provide an express service from Singapore to the Persian Gulf very successfully, because of the incredibly competitive transit time, and for the last six months or so we are providing a similar service from Hong Kong to the Persian Gulf. E- How successful have you been in Europe? AA- In Europe we provide regular services to the major ports such as Felixtown, Antwerp, and Hamburg and we have there in Malta a transshipment center servicing the Mediterranean ports, southern Europe and northern Africa. We carry goods from the far East and the Persian Gulf to Malta and transship them from Malta to these ports. This transshipment arrangement reduces costs and speeds up the service, and we no longer have to send half-empty ships to the Mediterranean. We are also trying to make Bandar Abbas a transshipment center as a rival for Dubai. Among the other markets we have entered, I should name the India to Europe line. As you know, next to China, the fastest growing Asian economy is that of India. Fortunately great enthusiasm has been shown among shippers who find this line very convenient indeed. It took us quite some time to convince the authorities involved that this was a profitable and useful service and fortunately today they can see the results of our plans and efforts. We then incorporated the line connecting Pakistan to the Far East into our Far East network, which proved to be another success. We then established a line from the Persian Gulf to Australia and New Zealand but this runs only on a monthly basis, not weekly, because the volume of goods to be transported is not large enough. Then, in line with the policies of the IRI's plans we established a line that connects West Africa to the Persian Gulf and the rest of the world but this operation is still on a trial basis and we await to assess the results. 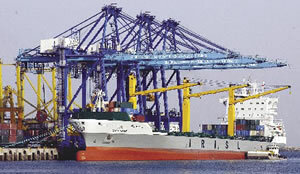 This service, from Iran to West Africa, is intended to help the expansion of Iran's exports to that part of the world. E- With all this expansion of services don't you need to expand your fleet and facilities? AA- We do indeed! As I pointed out earlier we have placed orders for a large number of container vessels, and we are placing orders for more. In bulk carrying vessels we are now the 13th country in the world as far as our capacity of Panamax bulk carriers is concerned. These are vessels that have a maximum width of 32 m and can thus pass through the Panama Channel, with a capacity of up to 75,000 tons. For the first time in the history of shipbuilding industry of Iran, we have also five container ships under construction, at Bandar Abbas, in ISOICO shipyard. Naturally, they are behind schedule, they lack sufficient experience and so on and so forth. But they are learning rapidly and their first ship is about to be completed up to international standards. E- I understand this is being done with the cooperation of German shipbuilders. Am I right? AA- That's right and they have been of great help teaching, our shipbuilders. Anyway, two other ships are half-complete and the construction of the fifth is about to begin. About cooperation with Germans, I should add that in fact there are six ships all together but because the first ship was built in Germany we cannot consider it as an Iranian built vessel although it was built by Iranians under the supervision of German experts. We now intend to award another contract worth 500 million US dollars to ISOICO for another 16 vessels to be built in Iran and this is bound to revolutionize the shipbuilding industry of Iran. Of these 16 vessels, six will be of Panamax type each of 75,000 tons capacity and the other 10 of Handimax type, which have lower capacities of 53,000 tons, or in that range. These are all bulk carriers. Another important work we have done or rather we have been involved in, is that we have formed a consortium with National Iranian Tanker Co (NITC) to carry LNG (liquefied natural gas). As you know gas is a very clean fuel and has very little effect on the environment. I have in fact called it "the fuel of the future". There is great demand for LNG, both in the Far East and in the West. We are behind Qatar in this field, because Qatar already exports LNG but we are only about to do so. However, Iran has signed a contract with India to supply LNG by sea. I am sure that, once this begins, China, Korea, Singapore… will also approach us for LNG. As I said we are a little behind in this respect but I am sure we will soon catch up. E- Isn't LNG a dangerous, a risky, cargo to carry? AA- No, on the contrary it has had the lowest rate of accidents during the last 30-40 years. Another point I should add here is that, some time ago we had the idea of completing the CHAIN VALUE and supporting our sea services with proper logistics and shore services to ensure that the receivers get their shipments very early, with the least delay. So, we have been selected to take over the port operations, and here I must thank our Port and Shipping Organization (PSO) whose management were very cooperative. We stared in a small way at the port of Khoramshahr using small vessels. The performance was 20,000 TEUs two years ago and have already increased to 80,000 TEUs, a four-fold increase. Khoramshahr is now a very active port. With this successful achievement, the operations of the container terminal of the port of Imam Khomeini was awarded to our logistics arm. Most of the facilities and equipment worth 20 million euros were ordered and by now are already in place and the rest are on the way. Within a few months you will witness a great positive change in Bandar Imam as regards container handling and by 2006 we expect to witness staggering success. The motive was the rapid and striking developments in the ports to the south of the Persian Gulf. We thought: if they can do it, why shouldn't we? We are now trying to attract foreign investors to these ports. We then thought that the chain was still not complete because there was a gap between the ports and the final destinations. So, we approached the National Railway and formed a joint venture with them for a railway line to carry our containers to final destinations rapidly and safely. The idea is to finally be able to provide an efficient door-to-door service. We are making progress; it is slow still, but sure to grow. E- Till five years ago your company was effectively a public entity but in the recent years you have repeatedly called IRISL a private company. How did this come about? Why can't other public companies do the same and become private? AA- Now, this is a very delicate subject, a key question. You are bringing up a subject that requires deep thought but I will try to answer your question and hope it will be adequate and convincing. You see, all over the world a company is said to be owned by the government or state if over 50%, say even 51%, of its shares are owned by that government. Such a company must work according to the rules and bureaucracy of the public sector, and it is generally difficult for it to be profit-making and to grow. The key to the problem is that the ownership of private or public must be separated from the management, which must be run by professional, I repeat, professional managers. We in IRISL convinced the government that we could run the company efficiently, we could make it profitable, we could expand it… provided they did not interfere with the management. Later we convinced them that it would be better for the country to allow the company to become private. And now, here we are! It is very important for the management to be professional, for the managers to be masters in the science of management. E- But don't you think you need more than knowledge to be a good manager. Don't you think that a manager must have talent, intuition, for management just like an artist or a musician? AA- Yes, I agree. The answer to the problem is that owners must find capable managers and give them a free hand: but they must be talented and knowledgeable managers. And, therefore, we need to focus on education and training, because we have to improve the knowledge, skills and experiences of our employees in general and our managers in particular. We need to constantly learn from the successful people and cases they have handled well… from all over the world. We also need to work hard as a team, with a clear strategic vision.